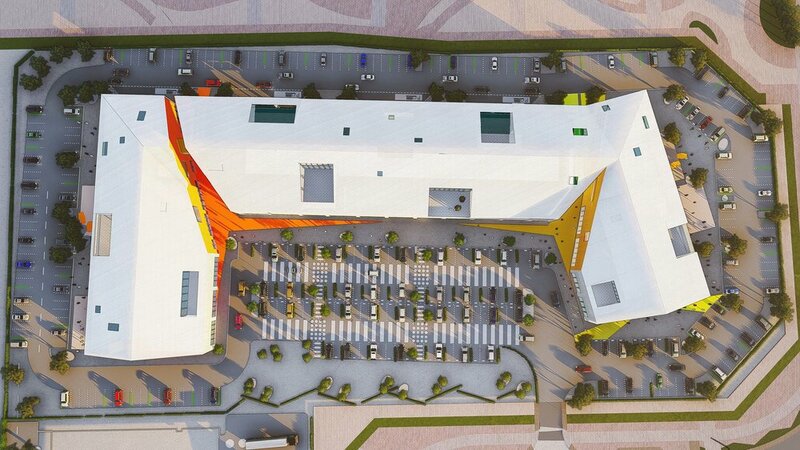 The Marine Showrooms form the gateway to the Marine Retail Cluster. In the spirit of the maritime we have taken inspiration from the lighthouses of Alexandria – designing to provide maximum natural light into the structures throughout the day and radiating light at nighttime, creating a beacon or lantern. The buildings span 200m to 300m and to create interest and introduce colour we have designed ‘breaks’ in their form. The colours chosen inform the signage and wayfinding strategy prevalent throughout the site. The unit layouts are flexible, adaptable as single or double aspect spaces depending on market demand. The building has a simple portal frame affording larger units for the showrooms below. The double-height ground floor can accommodate a mezzanine level in the future if the need arises for the tenants. The first floor is dedicated to offices.